Director Wim Wenders has a new film coming out called Palermo Shooting starring Campino (from the long running German punk band Die Toten Hosen), Giovanna Mezzogiorno and Dennis Hopper, as well as long-time Wenders collaborator Lou Reed in a supporting role. Music plays an important role in most Wenders films, and this one is no exception, the all-star soundtrack for Palermo Shooting features such varied and talented names as: Grinderman (Nick Cave), The Velvet Underground, Portishead, Iron & Wine, Beth Gibbons & Rustin Man, Beirut, Jason Collet, Bonnie Prince Billy & Matt Sweeney, Calexico and The Long Winters, just to name a few. The film is set to open in Germany on November 20, 2008 and as of yet has no scheduled US release date (that I am aware of). The soundtrack however is available now as an import over on Amazon.de for EUR 17,95. 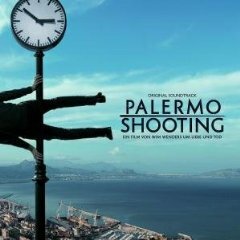 In coordination with the German premiere of the Palermo Shooting, Wim Wenders is planning a career retrospective concert on December 3 at the Tempdrom in Berlin with Jason Collett, Bonnie Prince Billy, Lou Reed, Portishead, Nick Cave, Get Well Soon, Monta, and a 60 piece orchestra (Das Filmorchester Babelsberg). I just read that this event was cancelled, too bad because it sounded like it was going to be a pretty cool concert. Full Palermo Shooting tracklist after the jump.